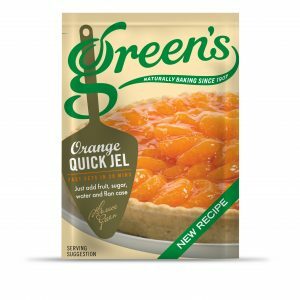 Try Green’s range of tasty dessert mixes which make it quick and easy to create wonderful desserts for family and friends, to be enjoyed by everybody. Impress your guests with such a simple but delectable range of desserts, that can be made in minutes, but never lack in quality. You only need to add water or milk to make most of these delectable desserts, so it’s the perfect way to get your baking career underway! We love to bring simplicity to our customers, making our dessert mixes the ideal way to combine easy baking and delicious treats. From a classic Carmelle to an indulgent Chocolate Mousse, there are lots of recipes and combinations to try. They can be used to make the product that you see on the packaging, or alternatively, you can see our recipes page and use our dessert mixes to create a fun and tasty twist on the classic desserts. A traditional milky dessert, follow the instructions then set in the fridge for 3 hours and serve your Pearce Duff Strawberry Blancmange! Enjoy this simple-to-make strawberry flavoured treat and buy one today from Green's Cakes, you don't want to miss out! A traditional milky dessert, follow the instructions then set in the fridge for 3 hours and serve your Pearce Duff Vanilla Blancmange! Enjoy this simple-to-make vanilla flavoured treat that you can share with all your family and friends, we also have <a href="https://www.greenscakes.co.uk/product/pearce-duff-strawberry-blancmange/">strawberry </a>and <a href="https://www.greenscakes.co.uk/product/pearce-duff-chocolate-blancmange/">chocolate</a> flavours. Making a velvety smooth and creamy Carmelle couldn’t be easier when you have Green's to help you. Tantalise the taste buds of your friends and family by treating them to this rich yet light caramel classic with a little help from your friends here at Green’s Cakes! For a zesty, zingy lemon pie you can top with light, fluffy meringue, look no further than our Lemon Pie Filling mix. Create this timeless classic and family favourite in your own home today, with the help of our easy-to-use lemon pie filling! Just a few simple steps and your taste buds dance between the tangy lemon filling, sweet velvety meringue and crumbly pastry base for a texture and taste combination that will delight all of your friends and family!